I couldn’t wait for this Thursday to arrive so I could go back to work on Waiting . . . it was time well spent as the seascape continues to be developed. 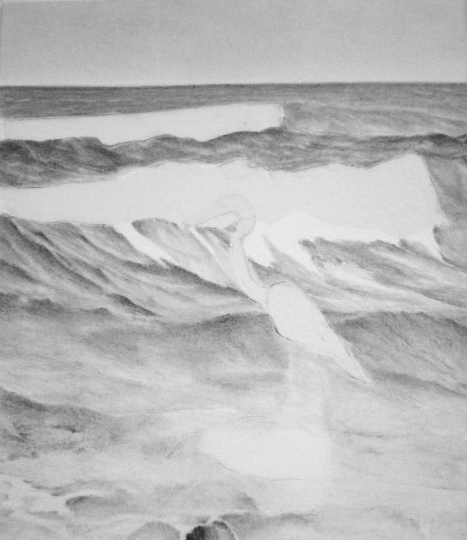 The drawing, using only graphite pencil (#2H, #HB, #B), started to take on a new look as the base for the entire body of water was completed and the foreground rock was started. The middle-ground waves were refined some and the foreground water was filled in, so much more has to be done to give the water its character, but I have to hold back so I can complete the foreground rock – the darks of these rocks are going to set the stage for the rest of the wave shadows and depth. I didn’t forget about the incoming wave and sea-foam, they’ll be worked on after the rocks and immediate sea-foam trails. And finally the star of the show, Mr. Egret will be the last and most important focal point to be drawn in. Do you feel your art while you’re creating? I do and today was no exception as the waves were being developed, I could definitely feel the movement. Here’s Waiting (9×12 on Strathmore Bristol, Vellum) . . . thanks for checking in! Beautiful flow is developing here Mary! Love how you use your tools and let your feelings flow out of it, all that is reflecting back on your canvass! 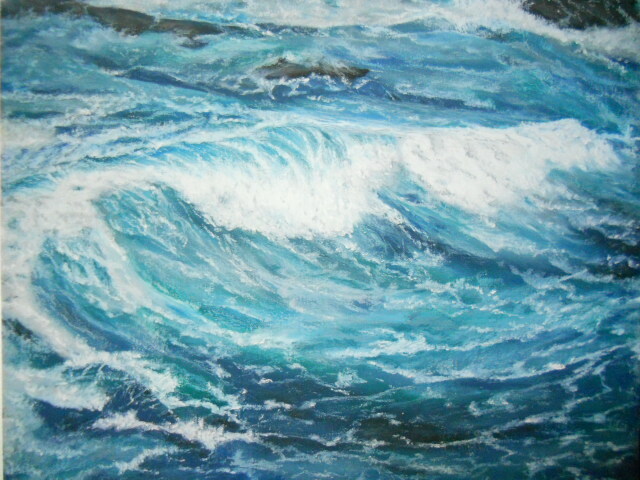 The rush and the freedom of creation is the true essence of creativity and is a wonderful feeling to be able to feel it! Thank you Eva – you are so right about the creativity process and I know you experience that “wow” factor of feeling in your work, the evidence is there. Working this drawing project has been very rewarding, taking on a life of it’s own. Developing the water has been fun, but I think the real excitement is going to be tackling the waves and sea foam – can’t wait to dig into this aspect of Waiting. Hi Rhonda, thanks so much. It’s a unique feeling to us creative types and doesn’t hit all the time on every project/piece, but when it does it’s very rewarding. So funny Poppy! I guess the title of the drawing really suits the scene, given how long it’s taking me to draw it. I think this is cheating, Mary ! – you’re bloody good at water. Ah M.R. you make my day. But of course, lousy at everything and yet find the “Mary” in whatever I’m trying to create – hope that comes through. Beautiful compliment, special one from across the world! How lovely that you feel that movement. Like evelyneholingue I think I feel my words sometimes. Thanks Gallivanta and I’ll bet you do feel your words or the thought of what you are writing is so intense that it takes you to another place entirely. Yes, feeling it is part of it, and another part is what Robert Frost calls “emotion recollected in tranquility”. Perfect Cynthia – it is Frosts’ description! Thank you very much. I think I understand…I can feel it too. Thank you so much Ann-Christine – I’ll bet you feel it every time you take one of your awesome photographs. Although I neither draw nor paint, I do feel the effect of my words each time I’m happy with my choices. Doesn’t happen all the time but when it does, it is indeed a wonderful feeling of freedom that only creativity provides. You’ve described it perfectly Evelyne. So well written Evelyne, it’s the soul of creativity – I agree. Although it isn’t always achieved, but when it is “Endorphin Rush” the results bares the artists’/writers soul and the viewer/reader can feel the rawness of emotion to which the creativity came to be.